We’re pleased to introduce a new binary options trade type: Reset Call/Put. The reset time is automatically set at the halfway point of your contract. E.g. If your contract duration is 10 ticks, your reset time is set at 5 ticks. The reset barrier is a barrier that is automatically triggered at reset time if the spot price is moving in the opposite direction of your prediction (as can be seen from the illustration above). Please note that if the spot price is moving according to your prediction at reset time, the reset barrier will not be triggered. 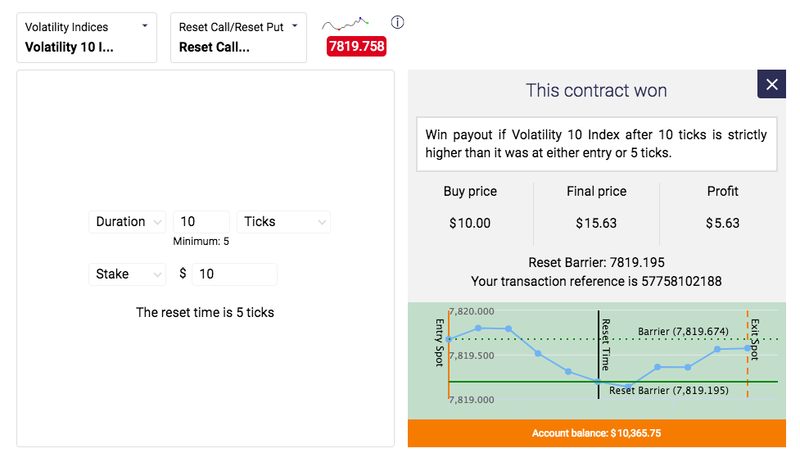 If you purchase a Reset Call contract, you predict that the exit spot will be strictly higher than the entry spot or the reset barrier. If the reset barrier is triggered, it means that the spot price at reset time is lower than the entry spot price. The reset barrier works to your advantage because once it’s triggered, you don’t need the exit spot price to be higher than the entry spot price to win the contract. The same mechanism applies to a Reset Put contract where you predict that the exit spot will be strictly lower than the entry spot or reset barrier. If the reset barrier is triggered, it means that the spot price is higher than the entry spot at reset time. You can start trading Reset Call/Put contracts now with your virtual or real money account.